When you think of Arab or Muslim political activists, you likely imagine flag-waving, fist-pumping protesters demanding rapid political reform. However, in the United States, Muslim political activism seems to take on a different meaning. Glancing at Wiaam Yasin, you wouldn't immediately assume she’s an activist with a passion for immigration reform. A petite 20-year-old who wears the Muslim headscarf, the Sudanese American native of Reston, Virginia, speaks Spanish, is passionate about immigration reform and hopes to volunteer abroad. Yasin is just one of many Muslim and Arab-American youths who are seeking social change in their local communities by focusing their efforts on minority rights, immigration reform and racial equality. 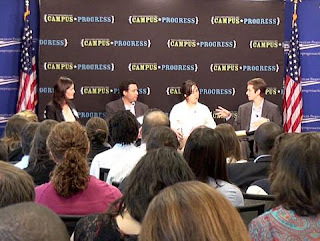 Her interest in social justice compelled her to attend the Campus Progress National Conference in July, organized by the Center for American Progress. The liberal Washington, D.C.-based think tank oversees Campus Progress - a nonprofit that supports student activists and journalists in colleges across the United States. The conference focused on a wide variety of issues, including youth voter turnout, media justice and Lesbian, Gay, Bisexual and Transgender (LGBT) rights. However, it was clear that the Arab and Muslim American youth in attendance had a particular focus: learning how to address issues of equity and breaking down stereotypes of minority communities. Sandra Khalifa, a summer advocacy intern with Campus Progress who also attended the conference, says her identity as an Arab American shapes the kind of activism she chooses to participate in. The daughter of Egyptian immigrants and a native of southern California, Khalifa says she felt isolated growing up in her non-diverse neighborhood as a child. That changed however, once she started attending the University of California, Berkeley - now her alma mater - which she says has an active Arab American community on campus. There, she discovered organizations such as the Muslim Students Association and Students for Justice in Palestine, both of which work to break down stereotypes. Khalifa is particularly passionate about immigration reform. As a summer Advocacy Intern for Campus Progress, she works to raise awareness about the struggles of undocumented immigrants in the U.S. and the importance of the DREAM Act. Short for the Development, Relief and Education for Alien Minors, the Act would, if passed, provide conditional permanent U.S. residency to some undocumented students, allowing them to pursue a higher education. Khalifa helped organize the first Senate hearing on the Act, which took place in June and hopes to study public policy in the future. There is a common perception that only Latinos care about immigration policy. “Not so,” says Yasin, which is why she decided to double major in international affairs and Spanish at the University of Mary Washington. As an intern with the Minority Community Outreach Office at the National Education Association, she has attended briefings on immigration reform in an effort to educate herself about political issues important to the Latino community. Yasin has already looked into study abroad options in Spain and volunteering in Latin America to engage with different cultures. She hopes that after her trips abroad, she will have greater motivation to do more for the Latino community in America. The speakers and panel discussions at the Campus Progress National Conference gravitated strongly toward civil rights, racial justice, welfare and other issues typically associated with the Democratic Party. The common perception that the Democratic Party platform is mainly concerned with these social issues is apparent in a 2008 study on American Muslim Voters commissioned by the Council on American-Islamic Relations. According to the study, 37 percent of respondents perceived Democrats as more likely to be favorable to Muslim Americans and their political concerns, while eight percent said that of Republicans. Nearly half of Muslim Americans identify as Democrats, while only eight percent are Republicans, according to the study. Louay Youssef, a 33-year-old member of the DC Young Republicans and senior technology consultant for the US government, said he thinks Muslim Americans hold negative stereotypes about his party’s platform. Youssef volunteered for the McCain campaign in the 2008 US presidential election and hopes to run for office one day. He cares about social issues and foreign policy, but he joined the Republican party because the Republican emphasis on fiscal responsibility and less government regulation in business resonated with him. Dr. Mohammed Alo, 35, a Chicago activist, strategist and physician, echoed similar sentiments. He is editor and founder of MuslimRepublicans.net, a website that gives politically conservative Muslim Americans a venue to express their views and network with one another. He says in the aftermath of the September 11 attacks, U.S. Muslims felt ostracized by American interventions in the Middle East and racial profiling under the Patriot Act. American politicians realized the need for outreach, and local policy makers in his hometown of Toledo, Ohio, asked him to write speeches addressing the Muslim community. Alo denies a common perception that Republican values are incompatible with Muslim lifestyles. “Muslim Americans identify with conservative values when it comes to religious beliefs, social values and fiscal policy,” he says. However, he admitted that when it comes to politics, they gravitate toward typically ‘liberal’ issues like minority rights and immigration reform because it resonates with their identities. Young Muslim American conservatives and liberals may not agree on fiscal policy, the health care debate and immigration reform. However, they do agree it’s time for Muslim Americans to focus their efforts on addressing local community issues instead of foreign affairs. “Muslims don’t get involved in politics unless there’s some foreign going on… We need to stop doing that,” said Alo. Yasin and Khalifa agree. Both say they hope to use their college education to pave the way for the future of activism in the young, Muslim American community.